Universal Windows Direct provides the highest quality replacement window installation services to Lancaster homeowners. Our windows are backed by industry-leading warranties, so customers know they can trust the quality of the products and services that we offer. In addition, replacement windows from Universal Windows Direct will eventually pay for themselves by saving money on your monthly energy bill. Replacement Windows Custom Made for YOU! Double Hung Windows - The most popular window amongst our customers. SuperSpacer technology makes these windows some of the best on the market for energy savings. Sliding Windows - Brass rollers provide quiet and effortless operation. Our sliding windows create a wide viewing area in any room. Casement and Awning Windows - Venting windows that crank open to allow maximum air flow. Specially designed hinges allow sash to fully open which enables easy cleaning. Bay and Bow Windows - Great for adding depth and light to a room. Expands your home's living space while providing energy efficiency. Garden Windows - For the homeowner with a green thumb. Opening sides provide ventilation and an optional glass shelf is available. Picture Windows - Provide and uninterrupted view and can be flanked with double hung or casement windows for ventilation. They also feature our Triple Seal System that blocks any air and moisture from entering or escaping your home. Entrance doors are the focal point of your home. They give homeowners peace of mind with security and protection, and they invite friends and family inside for gatherings and holidays. While you can simply purchase a new entry door from a big box store, they won't offer the same appeal as custom designed door from Universal Windows Direct. The first consideration you'll want to keep in mind is the material for your new door. Universal Windows Direct offers high quality fiberglass. Fiberglass is a durable option and will stand the test of time. If you're looking to save energy bills with the addition of your new front door, you're in luck. Our entrance doors are engineered with a polyurethane foam core. This foam core offers maximum thermal protection and dimensional stability. In addition to the foam core, your new entry door will also feature weather-tight features to keep the elements outdoors. This includes a weather strip to seal out air and elements, along with an adjustable threshold that creates a proper seal at the bottom of the door. One of the last considerations to keep in mind is glass options to add to your new entrance doors. Homeowners can design a new door that has top-to-bottom decorative glass, allowing natural light to pass through while keeping privacy in mind. If a full-length glass entrance door isn't in your future, homeowners can add sidelites, transoms, oval glass windows, and more. As you can see, Universal Windows Direct can help you design the entrance door of your dreams. Does your home need a boost in curb appeal? 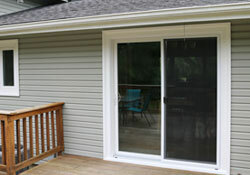 Installing new home siding is one of the best ways to dramatically transform the appearance of your home. However, new siding installation takes experience and skill to get the job done right. While you can certainly watch YouTube videos on how to install siding, there are several reasons why you should contact a professional siding company such as Universal Windows Direct. Professional siding installers ensure that no stone is left unturned. When you're installing siding for the first time on your own, it's easy to overlook important details. A professional knows the siding installation process inside and out, and you won't have to worry if the job was done right. Did you know that poor siding installation could negatively impact its performance? Even if you spend money on the highest quality siding available on the market, a bad installation job will send your siding's benefits down the drain. One thing you'll need to watch out for when replacing your home’s siding is warped or buckled boards. If your boards aren't installed properly, there is a good chance that your siding may warp down the road. Vinyl siding needs to be able to expand and contract with temperature changes, which is why pro siding installers hang the boards from fasteners. Some homeowners may attempt to simply nail the vinyl siding to the home, which ultimately results in damage. Poor siding installation can also lead to mold infestation. Mold is not only unappealing to look at, but it can also pose serious health risks such as asthma, headaches, fatigue, and even poor memory. If water gets behind the siding boards, your home will become quite vulnerable to mold. Bad installation will also diminish the effectiveness of your siding's insulation. Good quality siding helps your home maintain a consistent indoor temperature, but you'll need a pro to ensure that it's performing up to industry standards.